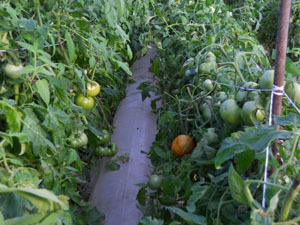 Two rows of tomatoes on December 1st on each side of a 12" diameter convection tube placed at ground level. Soil temperature is more critical for plant growth than air temperature. For example, growth of tomatoes will stall when the soil temperature is 56 degrees F or less, but begin to grow when the soil temperature hits 58 degrees F. Therefore, releasing heat energy at ground level is usually more efficient than heating the air above the foliage, especially during cloudy periods when the beds are not being heated by solar energy. The convection tube heating system shown in the photos below delivers warmed air from a biomass furnace outside of the greenhouse to the ground near the crop’s root system. Note that furnaces that have a blower fan are recommended when heat is dischared into a convection tube. A furnace with a propeller fan needs an extra ‘assist’ fan, such as the 16″ tube fan shown in Picture 3 below. Also, do not undersize the diameter of the heat discharge tube from the furnace because it can cause the furnace to overheat.